WCU’s Men’s Basketball team’s last home game of the 2018-2019 regular season had a lot on the line. With the No. 2 ranked team in the PSAC East, East Stroudsburg University, visiting, it was a very highly anticipated match up. The Golden Rams came into the match up on a program record 15-game win streak and 12-0 at home. Their perfect play in Hollinger Field House had them as the only undefeated team in the PSAC, East or West. Coming in on top on the PSAC East, the Golden Rams were looking to secure their first PSAC East title since 2006. With a 1.5-game lead over East Stroudsburg for the top spot, a win would’ve locked it in place. However, a strong second half by the visiting Warriors proved to be too much for WCU. The highly anticipated battle on Saturday was exactly that for the entire first. As shots were falling on both ends of the floor, it was hard for either team to take control of the game. Within the first few minutes, there were already four ties and multiple lead changes. The back and forth play would continue for the remainder of the first half with ESU holding a 41-40 lead going into break. During the first two minutes back on the floor, the Golden Rams regained the lead and the Warriors quickly responded. The Warriors were able to gain control and jump out to a 20-point lead, one they didn’t allow to get back into single digits. They were led by senior Josh Williams, who scored 22 off the bench and freshman Ryan Smith, who went perfect from the field on the way to his third straight double-double with 23 points and 12 rebounds on 7-7 shooting. East Stroudsburg’s collective effort on the defensive end was a huge reason for the 94-77 victory. They came into the game on top on the PSAC and ranked second in the country in both total steals (265) and steals per game (12.0). Also, they are forcing an impressive 21.59 turnovers per game, which is the second-best mark in the nation. The Warriors forced West Chester to shoot 35% (22-77) from the field, which is the lowest the team has shot in the last 17 games. The five three-pointers the Rams hit also marked the lowest amount the team has made in the last 18 games. Three of those long-range shots came from junior guard Malik Jackson, who led the way for the Golden Rams with 19 points. 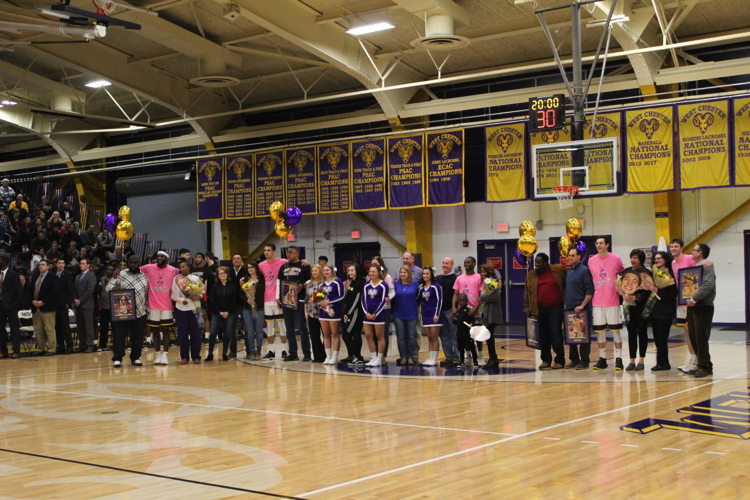 Prior to tip-off, five seniors were acknowledged for their play and contributions to the team during their time here at West Chester. Guards Mike Jolaoso, Frank Rokins, Matt Penecale and forwards Jackson Hyland and Mike Jenkins are closing in on the end of their careers in the purple and gold. The seniors and the rest of the team will travel to Shippensburg on Wednesday, February 27th to battle the Raiders to close out the regular season. The Golden Rams season ended at the hands of Shippensburg last season. “It was a tough loss. East Stroudsburg is a very good program. Coming in, I knew it’d be a battle. We just have to put it behind us. We have to finish what has been a great regular season against a team who ended our season last year so we must target our focus there,” Coach Blair had to say following the recent loss.